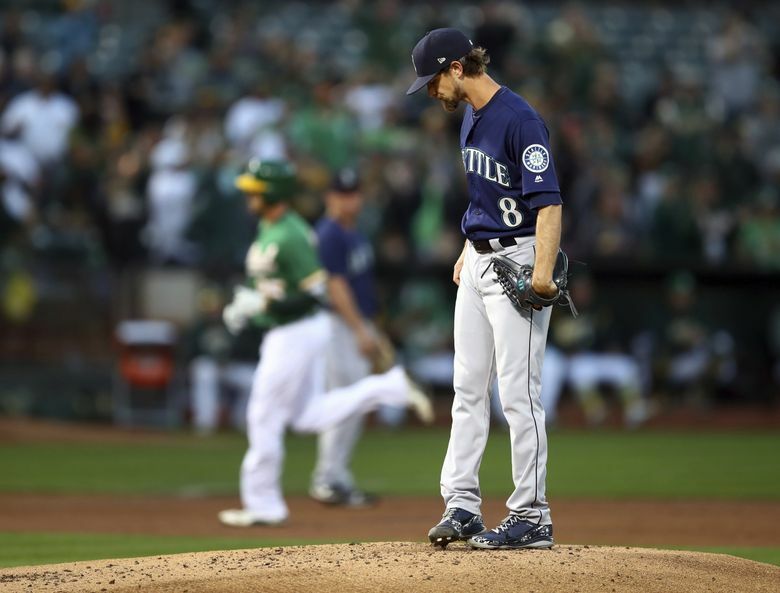 Seattle’s 7-5 loss on Friday night in Oakland offered a sobering reminder for the next two games of this four-game series. OAKLAND, Calif. — Tying the game was an accomplishment to be sure. The effort to come back after being waylaid in a five-run first inning was respectable. But it didn’t lead to a victory. And right now, for the Mariners, good efforts are relatively hollow in defeat. They still fell a game further back in the American League wild-card standings. 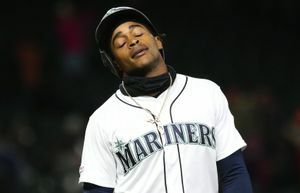 Besides wounding their playoff hopes a little more Friday night, Seattle’s 7-5 loss to Oakland offered a sobering reminder for the next two games of this four-game series and the three-game series at Safeco Field in the last week of the season, which may or may not mean something to either team. Late-inning heroics and comeback wins shouldn’t be expected. 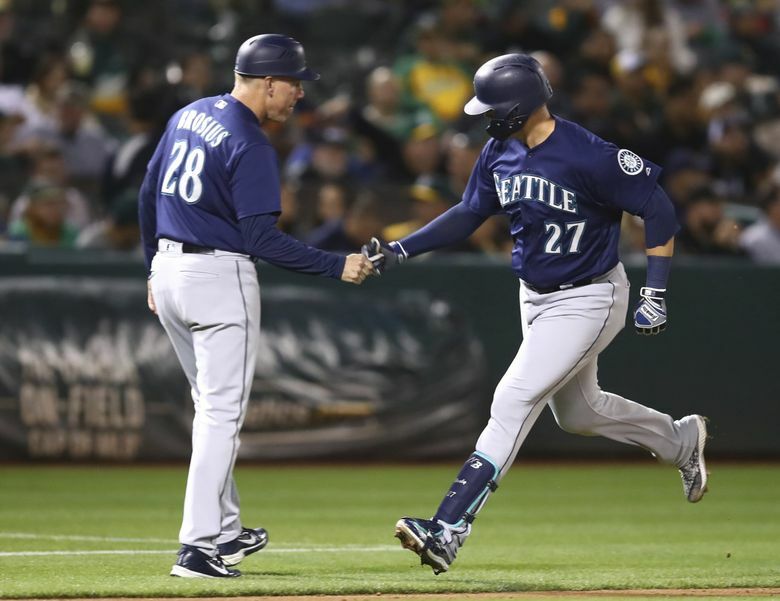 Manager Scott Servais’ mantra of keeping a game close and winning it at the end will likely only work against the A’s if Seattle has the lead going into the late innings. Because Oakland has assembled one of the best bullpens in baseball and can shorten and shutdown a game from the fifth inning on. And with rosters expanding Saturday, it will only allow the A’s to line up the backend of their bullpen to be more effective. After throwing together a stunning rally, including a four-run, three-homer fourth inning off Oakland starter Mike Fiers, the Mariners hitters that had blasted baseballs all over a sparsely populated Oakland Coliseum looked feckless over the final four innings against the A’s quartet of hard-throwing, nasty relievers — Lou Trivino, Fernando Rodney, Jeurys Familia and closer Blake Treinen. “We need to understand that we want to get to the sixth, seventh, eighth inning ahead because you know those guys they have and they all throw hard,” Robinson Cano said. While the A’s were able to scratch out a run in the fifth to break the 5-5 tie and add a huge insurance run in the sixth, Seattle did nothing after that fourth inning. Long reliever Yusmeiro Petit got the game to the sixth inning without letting the Mariners take the lead and A’s manager Bob Melvin just went inning by inning — Trivino in the sixth, Rodney in the seventh, Familia in the eighth and Treinen in the ninth for his 34th save. Oakland is now 57-0 when leading after the seventh inning. The Mariners got just two runners on base against that foursome — a pair of singles — while striking out six times. 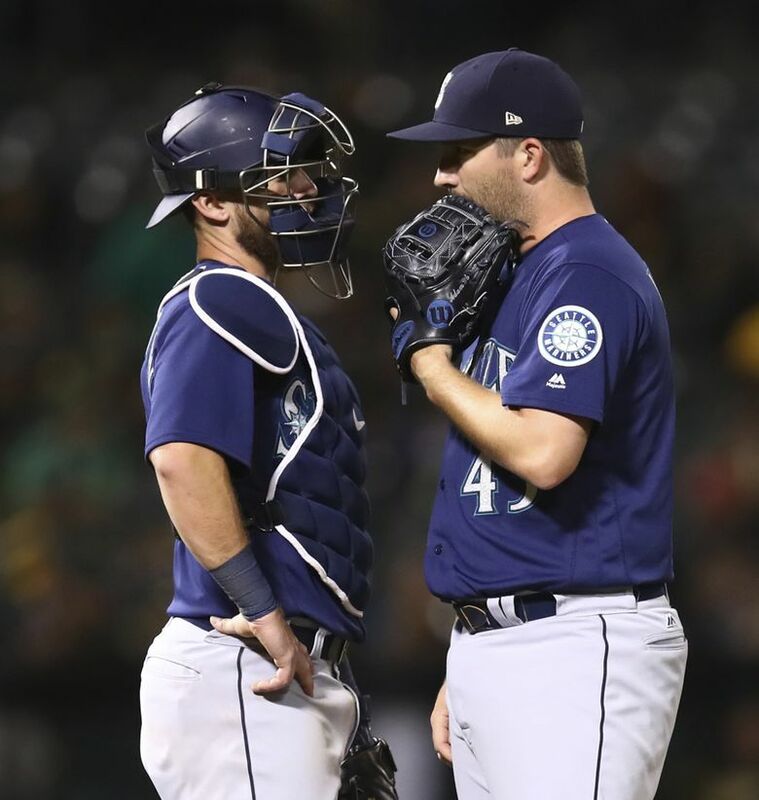 “You get down a run or two late against their bullpen with the way they’ve been going, it’s tough,” Servais said. Rodney and Familia were each longtime closers that led their respective leagues in saves for a season and made multiple All-Star Games, while Treinen and his 99-mph sinker was an All-Star this season. 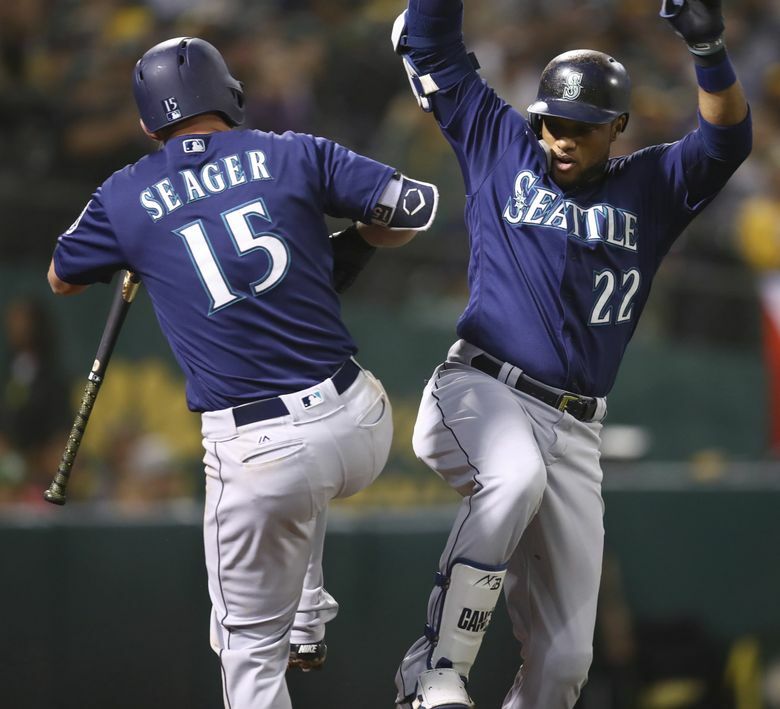 Seattle (76-60) fell back to 5 1/2 games behind the A’s (81-55) for the second wild-card spot in the American League. While mathematically they’ll still be alive Monday regardless of outcome, winning at least one if not both of the next two games against the A’s is critical to remain relevant with 27 games remaining. 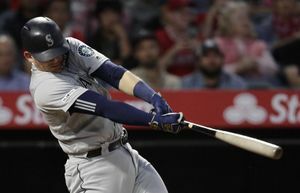 A night after scoring five runs in the first inning with the help of a defensive miscue, the Mariners surrendered five runs in the first inning, thanks in large part to a missed play on defense. 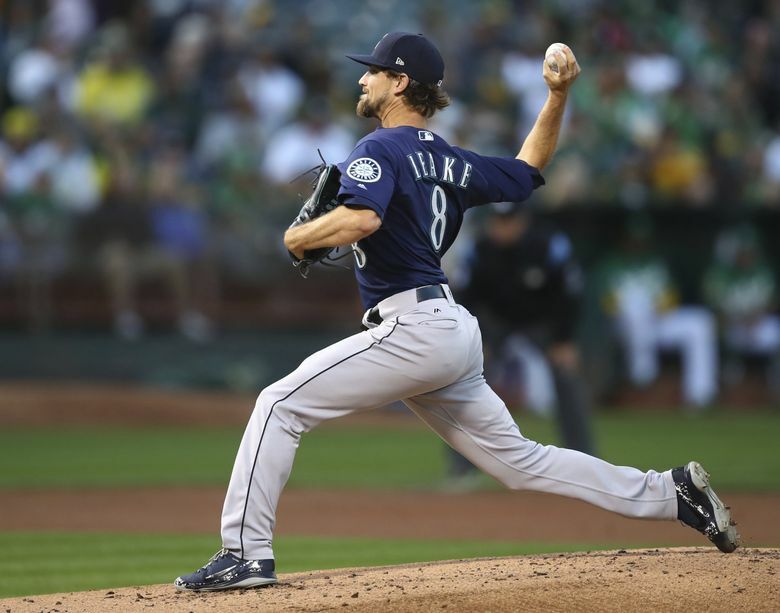 Oakland grabbed a 1-0 lead on Seattle starter Mike Leake when Matt Chapman, the player responsible for the defensive mistake Thursday, smashed a solo homer to deep left field on a hanging breaking ball. With two outs and a runner on first, Matt Olson hit a rocket to center field. But the line drive wasn’t going to be high enough to go out. However, center fielder Cameron Maybin made an awkward play on the ball, trying to retreat without committing to turning and running. He had the ball bounce off his glove while trying to make the catch. It was ruled an RBI double for Olson, but it was a ball that Maybin should’ve probably caught. And much like Thursday night, it opened the floodgates to more runs. Stephen Piscotty jumped on a first-pitch curve ball, putting it into the left-field seats for a two-run homer and a 4-0 lead. Another single from Marcus Semien and a double from Ramon Laureano made it 5-0. Leake finally retired Jonathan Lucroy, the No. 9 hitter to end the inning. Down 5-0, the Mariners didn’t roll over. They didn’t resort to two- and three-pitch at-bats trying to force something that wasn’t there. They trimmed the lead to 5-1 on Chris Herrmann’s two-out single in the second off Fiers. 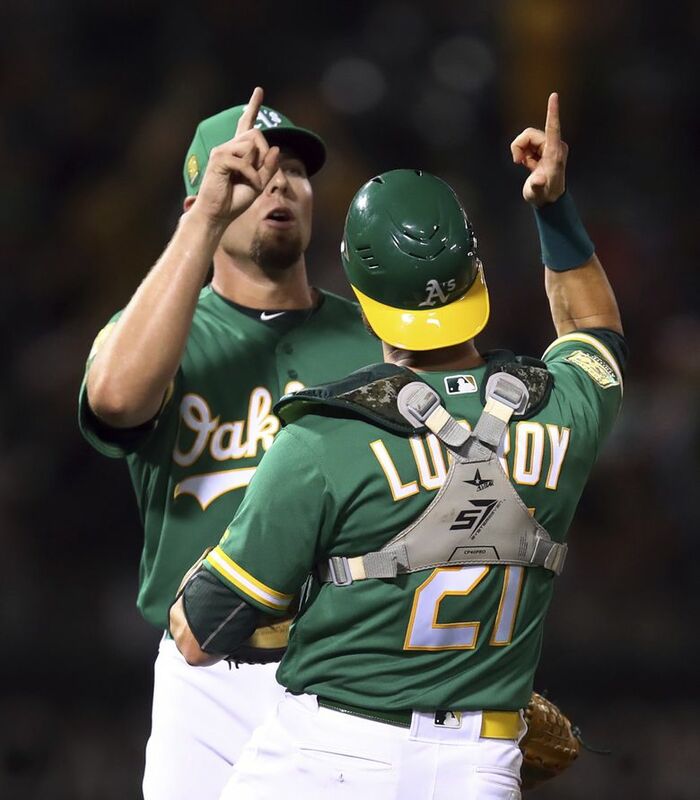 Fiers, a pitcher many fans felt the Mariners should’ve acquired after the trade deadline or at least prevented Oakland from doing so, never made it out of the fourth inning. In what would be his shortest and least productive start since joining the A’s, Fiers gave up four runs in the inning on three home runs from the Mariners. Cano led off the inning with a solo smash to right field. Nelson Cruz made it back-to-back solo homers, whacking a ball over the wall in deep left-center to cut the lead to 5-3. Kyle Seager momentarily broke the string of homers with a single up the middle. 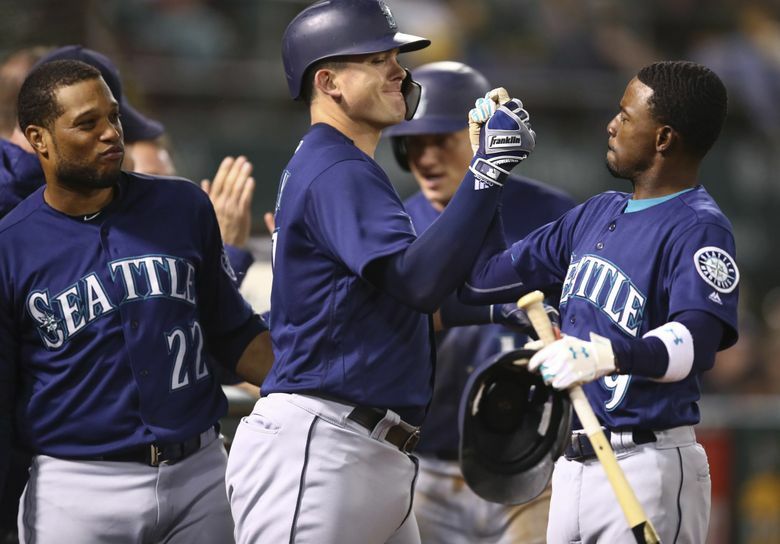 But Ryon Healy continued to do damage against his former team, crushing a ball over the wall in left-center for his 24th homer of the season and tying the game at 5-5. Leake couldn’t keep the game tied. He righted the wrongs of the first inning and pitched into the fifth, but allowed a pair of singles with an error on Haniger allowing the go-ahead run to score. His line: 4 1/3 innings pitched, six runs allowed on 11 hits with two walks and five strikeouts. Reliever Adam Warren cleaned up the inning, but allowed another run in the sixth.